Do you want to have a tropical Yoga retreat,want to picture yourself surrounded by nature? Want to establish an inner connection with the mother Earth? If so, you should try Sivana Yoga. 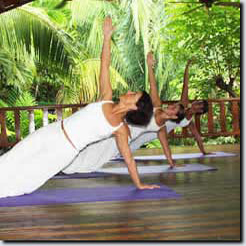 Through out this excellent yoga journey you will enjoy the beauty and tranquility of tropical beaches and rainforest. A 360-degree view of the surrounding jungle, beach and ocean will give a profound sense of peacefulness. As a perfect way to begin your week, you will have a wellness massage and scrub. This hour long massage session will prepare you for a tropical, laid-back, stress-free retreat week. Taking care your nervous system, this relaxing massage will calm your mind. There are some other spa services that you can enjoy including Manicure, Pedicure, Healing Hot Stone Massage, Swedish or Shiatsu Massage, Reiki Treatments, Reflexology, Tropical Mineral Facials, Chakra Stone Massage, Papaya Body Polish and Cucumber Aloe Facial. The morning Yoga sessions usually start at 7 AM. At the beginning of each class an expert instructor explains and describes the Asana and how to practice them. These sessions are designed not only for the beginners but also for the advanced practitioners. After this morning Yoga session you will get together for breakfast. This get together with like minded people will prepare you to start your day with a refreshed body and mind. Manuel Antonio, Costa Rica,home base for this retreat, has a lot of activities to choose from. If you are a serious adventurer, a day of whitewater rafting may interest you. If you like rainforest then you may find a sailing through the rainforest on a zipline more exiting. On the other hand a spectacular sail at sunset, or a magical horseback ride through the countryside can help you to slow things down a bit. At sunset, you will be enjoying Vinyasa, one of the most powerful Yogic method, sessions. While enjoying tropical sunset you will feel flow of Vinyasa sequences. An expert instructor will guide you through out the session. You will feel the bliss of mind body alignment. With all the amenities you have been looking for, Hotel Costa Verde is waiting for you. Spacious rooms and balconies will ensure your comfort and privacy, while two cliftside pools will give you the opportunity to get in touch with nature. A birds’-eye view of Manuel Antonio National Park’s distinctive coastline and the surrounding rainforest will make you spellbound. Bungalow A-13 There are two rooms in this bungalow. Containing one king size and one queen size bed, the main bed room has all the facilities you need. To make your stay comfortable, it has a kitchenette, full bath, cable TV, A/C, and internet access. The second room contains two single beds and a full bath, A/C, cable TV & ceiling fans. You can enjoy a small ocean view from one of two balcony. Casa Quinta This awesome bungalow has 2 and a half bed rooms and large living room. To ensure your comfort, it has a huge terrace and a large dining area. Each of the two bed rooms has queen size beds. Even the living room also has and extra large queen size bed. You will enjoy an independent air conditioner in one of the two bed rooms. As a bonus or gift you will get ocean view. Containing three queen size beds, a kitchenette, four ceiling fans, A/C & cable TV, this large studio is one of the best studios in that area. You will enjoy all the amenities you have been craving for and enjoy the perfect tropical ambiance. Do you want a balmy? Expensive screened windows? doors drawing ocean breeze? Then Sivana Yoga’s Studio apartments are for you. To ensure your comfort these studio apartments have a spacious balcony, two queen-size beds, kitchenette, and ceiling fans. There are at least three fantastic restaurants here in Costa Verde. All these restaurants have all the essential facilities including Ocean views, sunsets, fresh seafood, and live music. Love jungle and ocean vistas? Enjoy about fresh fruits and seafood dishes? Want to try some of the best Costa Rican and international cuisine? Anaconda,an awesome restaurant featuring seafood, chicken, steaks and ribs on an open wood fire, is waiting for you. Looking for a restaurant featuring informal dining, spectacular sunsets, and live music? El Avión, latest addition to Costa Verde, is there for you. You will enjoy the uniqueness of this restaurant as it has been built using 1954 model C-123 cargo plane! Do you want to try delicious entrées such as steak, chicken, fresh fish, jumbo shrimp, or lobster while enjoying the tropical atmosphere? While listening the live rhythms of reggae and Latin music? Then you must try The Cantina, an excellent restaurant, as it is just a few minutes from your room.